Here it is, Bobby Pattinson's fourth comedy DVD and what a treat it is! Jam packed with jokes, anecdotes and one-liners, this performance took place in April 2008 at the recently renovated Empire Theatre in Consett. This DVD features the latest instalment of Bobby's never-ending tour of the North East's venues and follows earlier recorded shows from the The Playhouse in Whitley Bay, theGala Theatre, Durham & Phoenix Theatre, Blyth. In this performance Bobby treats his loyal audience to another hilarious romp through his enormous repertoire of comedic fact and fantasy. There are jokes about all manner of things - work and play, trouble and strife, success and failure. His stories feature a cast of wives, girlfriends, doctors, teachers, golfers, little kids, old blokes and many more besides, they all get the Bobby treatment. It's a testament to his skill and experience that he has the audience in the palm of his hand from the opening gag and that they stay laughing till the standing ovation they give him at the end. 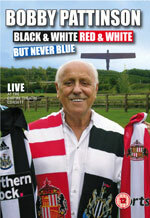 Bobby's enduring popularity throughout the north has been the inspiration for this DVD's title. Bobby sees the North East as one homogeneous region, we may have our little differences of opinion, but we've all been through the same troubles and all laugh at the same jokes, ultimately we're all canny, decent folks at heart. When he was a lad he would go and see Newcastle United play one weekend and Sunderland the next and even took in Middlesbrough matches when he could get there. He wanted them all to do well. His affection and respect for his fellow North Easterners is also the reason he keeps it clean. He's had them rolling in the aisles for over forty years without ever resorting to jokes that you couldn't tell your Mam. Sit back and enjoy Bobby Pattinson, live at the Empire Theatre, Consett.... Black and White and Red and White but Never Blue.